The Hemlock Tree is from the evergreen conifer classification. There are up to ten species of the tree, the most common being the Eastern Hemlock and the Western Hemlock. It was given the genus name tsugan by Stephen L. Endlicher who was a botanist from Austria. The Western Hemlock (Tsuga heterophylla) is the species found in the temperate rainforest of North America. Various species of Hemlock trees can be found throughout the United States, parts of Canada, and even Asia. Most of the species thrive when growing wild in dense, moist, cool forest regions where the ground is rocky. What makes these trees so useful is their wood and bark. In fact, Hemlock wood grows harder with age, making it a great alternative to costlier hardwoods. 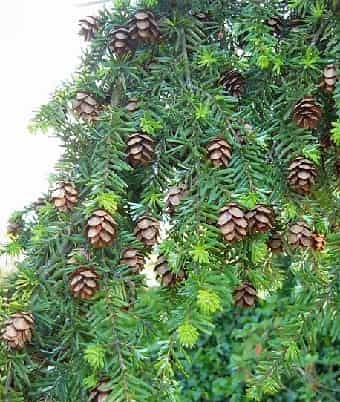 The information listed below talks about what the main characteristics of the tree are, why it makes a great ornamental tree, as well as basic Hemlock Tree facts. The Hemlock Tree is also known by the following names: Spruce Pine, Hemlock spruce, tanbark, and weeping spruce. The only color change on the foliage signifies new or old growth with dark green being old growth and light green to yellow being new growth. The Hemlock produces some of the smallest cones in the pine family. It takes 20-40 years for the Hemlock to produce seeds in the pinecones. Animals that feed off this tree include rabbits, deer and squirrels, who prefer the twigs while porcupines prefer the bark. The needles and cone seeds are eaten by birds. Although not related, the Hemlock Tree got its name from the poisonous Hemlock plant because of the similar scent it gives off when the needles are crushed. The Hemlock Tree, however, is not poisonous. The deeply ridged, scaly bark of the tree generally ranges from grey to reddish-brown and usually gets darker as it ages. With heights of up to 150 feet (45.72 meters), Western Hemlocks are larger than Eastern Hemlocks which usually top out at 70 feet 21.33 meters). This triangular shaped, medium sized tree has short, less than 1 inch (2.54 centimeters) flat needles that are attached to twigs on the tree. The woody cones are oval shaped and grow from the end of the branches. They are abundant throughout the tree. The Hemlock Tree has been a valuable resource throughout history. Native American Indians used them for basket-weaving, tanning, items for children, and wool coloring. Starting in the 1940s the wood from Hemlock trees became increasingly used for lumber. Previously it was generally regarded as being too knotty. Today, the lumber industry relies heavily on this tree for paneling, furniture, and flooring. The Hemlock is commonly used in landscaping designs, as a stand-alone tree and as an aid against erosion. The bark of the tree has become valuable as a source of tannic acid which, when infused into leather, makes it softer and stronger. Pine needle tea, which contains vitamin C, can be made from the Hemlock Tree. This tea was made by the Iroquois Indians for centuries.